Lately I've been on a cooking/nesting kick which is good for little Levi, because it means I've been trying new recipes for him, too! 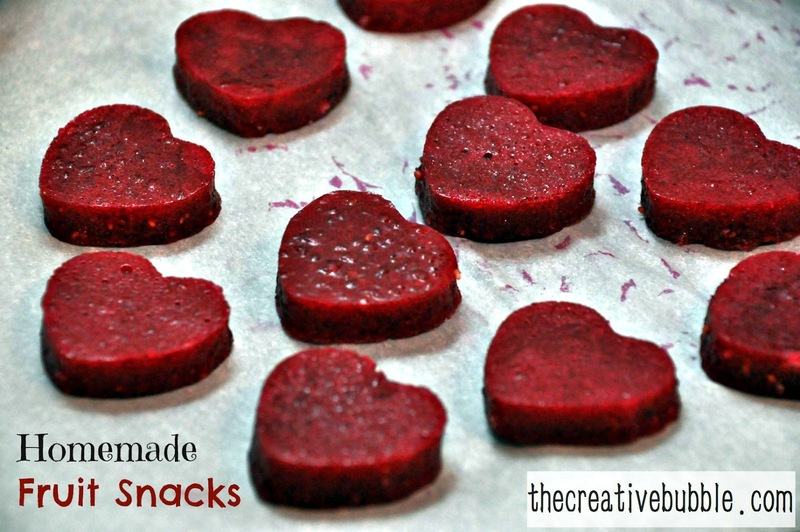 I ran into this recipe for homemade fruit snacks on pinterest a while back, and it was nagging at me to be tried all the while. It took me no time all to make them, and I actually had everything to make them on hand when I got the urge to do it. 1. Pour juice and berries into a small saucepan. Heat over medium heat, stirring occasionally until berries become tender and begin to soften. 2. Add honey and stir until completely incorporated. 4. Let sit, off heat, for 5 – 10 minutes. 6. Pour into a 8 x 8 or 9 x 9 glass or metal dish. Refrigerate until set (30 minutes to an hour). Cut in small squares, or you can use cute cookie cutters. I went with hearts for Valentine's Day. I used the recipe I found here on thankyourbody.com. I used a metal cake pan. The mixture just came right out of the pan after I cut the edges. I was afraid it would stick. Here are all the scraps I cut up after using the cookie cutters. These taste really good, and Levi loves them. It's hard for me to resist eating them all! I think it would be fun to try some different flavors like pineapple or pomegranate. Awesome. I'm going to try this! Do you need to refrigerate to store? These look delicious! I just pinned your recipe to my pinterest! Searching ideas and getting inspired! Thanks!